Glenn Beck on the Statue of Liberty | America loves Sporks! 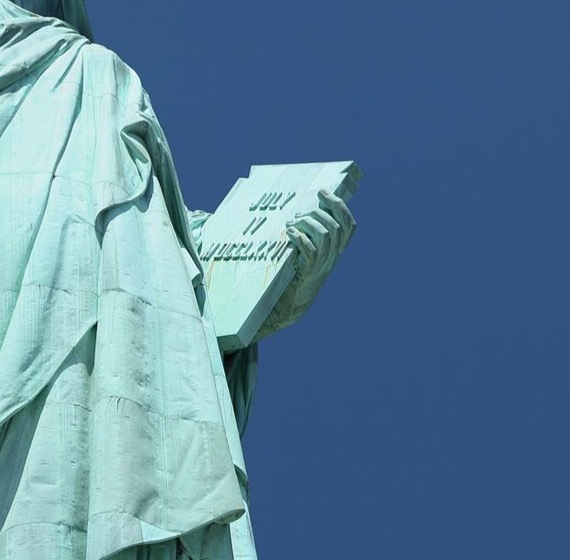 Glenn Beck picked up the criticism of a columnist for Smithsonian Magazine – who proposed her belief that the sculptor of the Statue of Liberty intended it to represent a Muslim woman. The columnist is severely wrong. She also says she is afraid to visit Planned Parenthood to get her Pap smear tests because pro-life activists might shoot her. Uh-huh. Riiiight! However, in his zeal to correct wrong history, Glenn and his crew asserted multiple times that part of their proof she is not a Muslim is the French sculptor put a tablet of the 10 commandments in her left hand. Glenn may have confused the Statue of Liberty with a similar statue in Boston. Boston was raising money hoping to get the statue which was being built in pieces Starting in 1871. This might be the source of his mistake. The Statue of Liberty was erected in New York in 1886. Boston tried and failed to have the statue located in Boston. In 1888, “Faith” was erected in Plymouth by the Pilgrim Society designed by a man from Boston. The “10 commandments” on that statue is actually a list of names of the passengers on the Mayflower. This entry was posted in American Politics, Glenn Beck, Individual Liberty. Bookmark the permalink. A little connection I found while researching the original story was the torch was redesigned in the early 1900s after electricity became available on the island, so the torch could be illuminated. The man who redesigned the torch in 1916 – Gutzon Borglum was a KKK member who was the same man who carved the tribute to the Confederacy into Stone Mountain Gergia and later carved Mount Rushmore. If anyone cares to totally deconstruct history, look into the role of France in encouraging the South to secede from the United States.